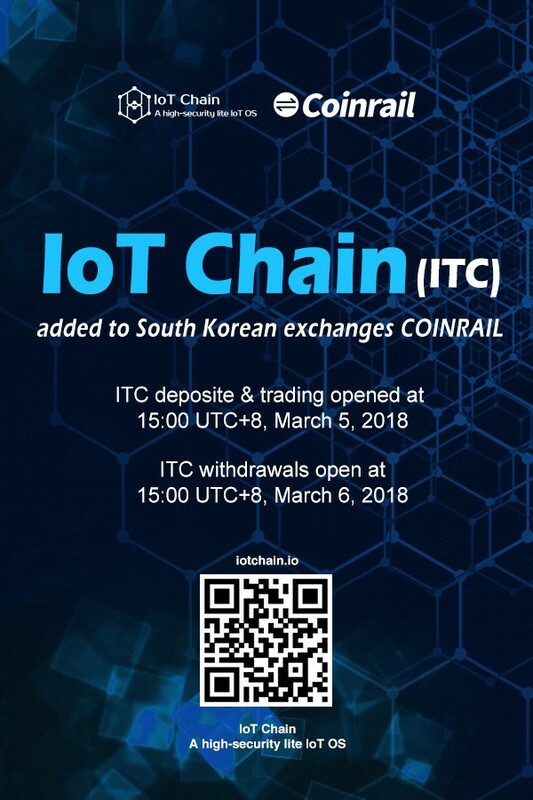 ITC has officially been added to its first South Korean exchange Coinrail! ITC deposits and the ITC / BTC trading pair opened at 15:00 UTC+8, March 5, 2018. ITC withdrawals open at 15:00 UTC+8, March 6, 2018. The IoT Chain team recently attended a private meeting hosted by FBG Capital in Seoul, South Korea. Their presentation was well-received by the audience. Representatives from Korbit, Coinone, GOPAX and other well known trading platforms were in attendance. The listing on Coinrail marks ITC’s official entry into the Korean market, furthering the project’s international structure and global influence. Further, the IoT Chain team has been invited to a private meeting with #Hashed (formerly known as Blockchain Partners Korea) in the coming weeks. Stay tuned for more details! ITC added to Coinrail exchange! Coinrail is a South Korean trading platform ranked 6th overall in volume. It focuses on the South Korean cryptocurrency markets and is committed to driving growth of cryptocurrencies worldwide. Headquartered in Seoul, Coinrail is a fast-growing trading platform that currently supports both KRW (Korean currency) and BTC (Bitcoin) trading pairs.